If you’re new to arranging chord melody, this DVD and book will get you started immediately. You will learn Robert’s rock solid approach for constructing a chord melody arrangement from a simple melody line or lead sheet. New to arranging chord melody? The Chord Melody Assembly Line book/DVD will get you started immediately. 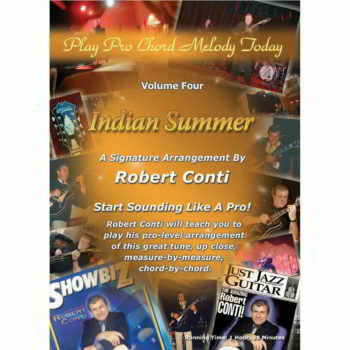 As most are aware, Robert Conti is well known for his ability as a soloist who can confidently step in front a rhythm section and peel paint off the walls at ridiculous tempos, with total authority. 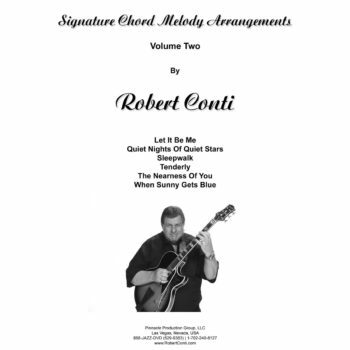 However, in addition to his reputation as a bop player, Robert Conti is also well documented as a highly successful solo jazz guitarist. An exquisite sound and a repertoire over three thousand songs keeps him in demand for numerous “high end” private functions in Las Vegas and Los Angeles. His stellar credentials also include a ten year engagement in a luxurious Southern California hotel. From Lesson One, you’ll discover how easy it is to actually start assembling a working collection of chord melody arrangements of your favorite songs. In addition to learning the “assembly line” protocol, Conti takes it a step further and walks you through three complete songs. If you’re ready to learn the art of solo guitar, this DVD is your opportunity to learn from a working Pro, who actually performs nearly every night of the week. Don’t settle for anything less than this level of quality instruction from a bona fide Pro. We are frequently asked the difference between The Formula and The Chord Melody Assembly Line. Simply stated, if you’re just starting out with wanting to create chord melodies from a lead sheet or fake book, start with this product, then move onto The Formula which thoroughly covers Robert’s approach to advanced reharmonization. After many years of little progress in learning to play in this style, my admiration of Conti’s playing led me to order “The Chord Melody Assembly Line,” and it’s been a game-changer for me. The initial lesson quickly showed me how even a simple melody can be richly harmonized, and this early success motivated me to learn the next lesson, and the next. Currently, I’m about 1/3 of the way through the book, and am amazed at how Conti is able to present information in a way others cannot: he makes it accessible, learnable, musical, and immediately useful. Success leads to motivation, motivation leads to effort, and effort leads to even greater success, until the student is eventually doing things he or she once thought they could not do. 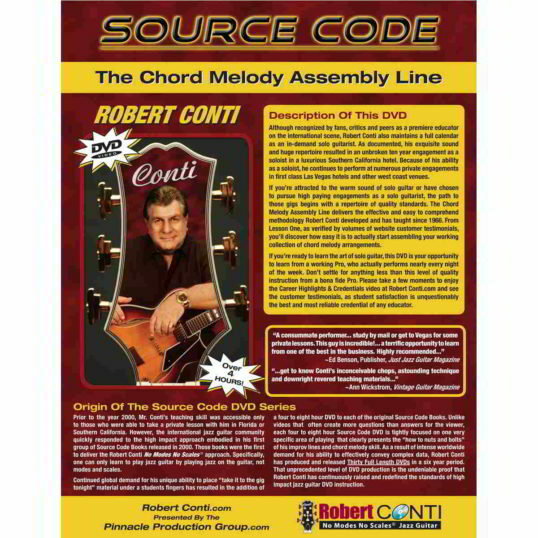 I’m using this book in tandem with one of Conti’s “Play Pro Chord Melody Today!” arrangements, and I recommend this approach to anyone considering this particular Source Code book/DVD set, because it gives you an opportunity to learn a tune while you learn the method behind its arrangement. Buy this book! A year from now, you’ll wish you’d started today. My wife asked me: “Was it worth the money?” I said: “Yes, if I knew before, what big connections the Chord Melody Assembly Line would provide for me, I would have payed 10 times more, because I can play chord melody from one moment to the other. I understood the system at once, even I still don`t know were Robert Conti take all these chords in the Signature Chord Melody Arrengements, so I will order the other books too.” So I ordered the Chord Melody Assembly because 40$ is not so much, even if it is useless. IT WAS NOT. Mr. Conti doesn’t lie, when he promises you: “You can learn it” YOU CAN. I saw a video clip – thank the Lord I overcame my initial skepticism. Previously I had spent a lot of money for meager results. The method is pure genius. This has been a real eye opener. I feel like a struggling amateur magician seeing a Penn and Teller show for the first time. Just got the Chord Melody Assembly Line and the bonus dvd (ticket to improv – thanks!). I have spent hundreds of dollars on many books and DVDs on chord melody. Some are very good – but I really wasn’t learning anything – just playing someone else’s stuff. And they do not have anything like this – correct melodic voice leading that you can use immediately and then you can play from a lead sheet. I literally just stumbled on your website. What a happy accident. I can’t thank you enough. Hello again Bob and Co! I have finally decided what I want to do musically, and turned my focus back to jazz chord melodies. My serious aim is to be able to play a good (and large enough) set of them at weddings, etc. Of course, the ‘Chord Melody Assembly Line’ book and DVD were my first port of call. WOW! – What an easy way of going about things. I spend an hour a day working on one of the other Play Pro Chord Melody DVD arrangements now (Since I Fell For You, God Bless The Child, etc.) and an hour on the ‘Chord Melody Assembly Line’ and it will happen for me I know. THE CHORD MELODY ASSEMBLY LINE DVD is truly amazing instruction that I so wished I had years ago. The whole idea of listening and playing the instrument is my way of getting it all together on the guitar and that’s what the Conti method is luckily all about. I used to be a big Eric Clapton fan… However he’s definitely been unseated by RC. The Chord Melody Assembly Line has opened up the world of chord melody playing for me. I’m a not-so-gifted amateur and playing guitar is my primary form of relaxation. As a physician, I’m too busy for formal lessons. Until this book and DVD, I’d struggled with chord melody playing. The Chord Melody Assembly Line has given me the tools to create my own chord melodies from fake books. I must thank Mr. Conti for his direct approach to teaching. My technical limits keep me from playing his full arrangements but his approach is so clear that I can make up my own. I’m playing music, songs people recognize, and not exercises. Keep up the good work – I am really getting this stuff under my fingers now and loving it thanks to your Boss and you guys. I recently ordered the Formula-DVD and the Chord Melody Assembly Line-DVD. I want to thank you for your prompt response and for the complimentary upgrade to Priority Class Mail. I received the books in only two days. I also want to thank you for the complimentary two video lessons and chord melody arrangements. I’ve been playing guitar for a number of years and am now just starting with Chord Melody. I must say that your Chord Melody Assembly Line book with DVD has broken the code for me. Your straight forward approach to presenting the material has answered my numerous questions and unleashed the mystery of Chord Melody. The videos are outstanding and makes the information easier to understand by watching and hearing you go through the material. The added side notes not covered in the book are also invaluable. Your books have given me the confidence that I can learn Chord Melody by getting it under my fingers. Thank you again and I look forward to going through both books. I can’t praise this product too highly. Suddenly a subject that was a complete mystery to me has become crystal clear – and hugely enjoyable. Mr. Conti is a excellent teacher both on the page and on DVD. If I ever get to the States I’d like to shake his hand for revitalising my playing at this late stage in my musical life (I’m 55!). At last I can sit down, just me and my guitar, and produce some great solo music. This makes me very happy. I’m looking forward to moving on to The Formula soon with the same enthusiasm. Robert, Ann in your organization was kind enough to help me choose the Chord Melody Assembly Line about a year ago. Just wanted you to know that I am now playing about once a month in front of our church congregation. Last Sunday evening I played There is Just Something About That Name, as a chord solo, by using your system. I got lots of nice compliments, but the best was from the Pastor’s wife (a great keyboard musician) who told me that when she listened to me play guitar it was as if the guitar was singing. Thanks so very much for your informative lessons and ideas. This has opened up a new world for an old rock-n-roller like me. Robert, I have just ordered the CMAL and cant wait to get a hold of it! I have just pretty much finished ‘Since I Fell For You’ and am starting on ‘God Bless The Child’ and it looks like the learning curve is flattening very quickly now. With the basic skills and this wonderful aid to quickly assembling my own arrangements I am looking forward to really taking off. I have come a looonnng… way already thanks to you. Mucho Respecto Master Conti! I have used a wide range of materials and have not found one that pulls it all together like this. It is a book that provides the fundamentals in a way that a player can “get it under their hand” right away. The logical structure and flow of the book provides to the tools to enable a player to put their own chords to tunes. It also has enduring value for a player to keep growing and reinforcing their chord vocabulary. The DVD provides a bonus so you can see & hear how to make it happen. Thanks a lot for the excellent service. I am a customer as happy as can be. Everybody says Conti delivers like no one else in the biz, in both content and service mindedness. This is six star service and I will definitely recommend your products and your great service to any it might concern. Please convey my appreciation to Mr. Conti. His basic course on chord melody has resolved a huge mystery for me. I want to thank you for your prompt response and for the complimentary upgrade to Priority Class Mail. I received the books in only two days. I also want to thank you for the complimentary two video lessons and chord melody arrangements. I’ve been playing guitar for a number of years and am now just starting with Chord Melody. I must say that your Chord Melody Assembly Line book with DVD has broken the code for me. Your straight forward approach to presenting the material has answered my numerous questions and unleashed the mystery of Chord Melody. The videos are outstanding and makes the information easier to understand by watching and hearing you go through the material. The added side notes not covered in the book are also invaluable. Your books have given me the confidence that I can learn Chord Melody by getting it under my fingers. Thank you again and I look forward to going through both books. Stopped and started a few times as there seemed to be too much memorization. What I finally did was just use the chord forms for the 7 notes of each scale (less than the book illustrates) and that made it much easier. And once i figured that out I realized I could use all the other voicing alternatives I know that aren’t in the book but work.